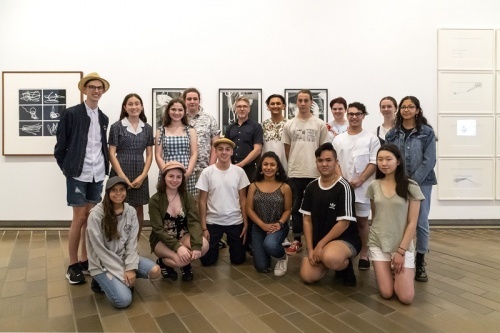 “THOSE summer students just don’t stop asking questions,” said one staffer at the National Gallery of Australia as “CityNews” prepared to meet 16 enthusiastic participants in the 2019 National Summer Art Scholarship and their workshop facilitator David Rosetzky. It was true. The young artists, who are senior secondary students from around Australia, had come from as far as Balcatta Senior High School in Western Australia and Centralian Senior College in the Northern Territory and were visibly bouncing with excitement as they prepared for their afternoon session. The program takes in students hoping for a career in the visual arts, with alumni from its past 21 years now working in education and museums and galleries throughout Australia. The idea is for the scholars to meet NGA staff, get behind the scenes, participate in a life drawing workshop at the ANU School of Art and Design and immerse themselves in workshops, which included a walk on the wild side yesterday (January 16) when the students created, then immediately pulled down, a large art installation in the Fitters’ Workshop. 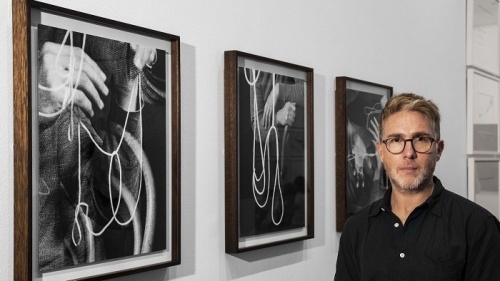 Enter Rosetzky, the photo media artist from Melbourne whose work formed the basis of more than 400 applications to the summer program, coordinated by the gallery’s Adriane Boag. Rosetzky, who describes his own work as “contemplative, interior”, told “CityNews” of his admiration for the National Gallery of Australia, which holds some of his work, and for the neighbouring National Portrait Gallery, for which his digital video portrait of Cate Blanchett was commissioned to coincide with the opening of the building back in 2008. As well, he said, his black and white portrait of singer Jessica Mauboy was now hanging in the NPG’s “20/20” exhibition. As he waited for the students to arrive, he told “CityNews” he would share his methodology with them. “I’ll tell them how I create work, how I use my processes,” he said. Students, he said, would be asked to interview and write textual material about their portrait subject before using moving image, still photography and possibly text in their portraits. Rosetzky’s series “From memory”, on show at the NGA, shows a piece of string, a pair of hands and a chair. He said “Tangential to portraiture” involved black-and-white photography with a 35mm film camera. He also used double exposure to overlay an extra level, which was flipped onto its side giving the sense of defying gravity. Applicants to the summer scholarship were asked to write responses to this work. Initially making portraits of friends, Rosetzky later specialised in videoing professional dancers, also working with Melbourne actor Stephen Phillips to “bring out strong emotional memories”. The video work allowed him to find “fluidity of identity” in hi portrait. It was time for the kids to turn up. 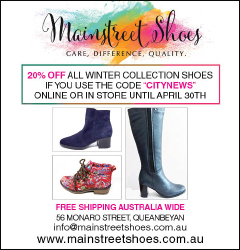 Chosen from each state and territory they told “CityNews” about their differing specialties — watercolour, pen, video filming, black and white photography, oils – and in the case of one, “a bit of everything”. Inquisitive and gregarious, the excited students fired as many questions at “CityNews” as they had been asked. It was obvious that they’d be giving Rosetzky a run for his money, and he didn’t mind one bit.